Transport Minister Stewart Stevenson praised the round the clock operation to keep traffic moving and said travellers should continue to take extra care when out celebrating the New Year. “Adverse weather conditions continue - some of the coldest conditions in recent times - and temperatures are set to plummet below freezing again with snow predicted for parts of Scotland. “Roads will be busy and people should continue to take that extra bit of care when travelling. Gritting and road safety operations will continue around the clock and local authorities are doing a tremendous job in the circumstances. Traffic Scotland, the traffic management service, is continuing to monitor the situation with the police and operating companies. The country’s transport network is continuing to cope in the face of plummeting temperatures thanks to the dedication of workers keeping things moving, says Transport Minister Stewart Stevenson. As freezing conditions and high winds were predicted to take us into the New Year, Mr Stevenson praised the 24-hour operations to keep traffic moving over the festive period. And he called on the public to take extra care when out and about, particularly over Hogmanay when temperatures in the main cities are not expected to get above minus 3C and in rural areas where minus 8C will be the norm. “Our roads are expected to be extremely busy in the next 24 hours as we celebrate the new year. It is therefore vitally important that the public take extra care to minimise the risk of accidents. "The freezing temperatures throughout the country and strong winds across the north and north east mean it will feel exceptionally cold with the possibility of black ice on untreated roads and pavements. “Gritting operations will continue around the clock and there are substantial salt stocks around the country with supplies about to be replenished. Traffic Scotland, the traffic management service, is working in tandem with the emergency services to keep Scotland moving as we witness continued freezing temperatures. Transport Minister Stewart Stevenson has praised the mobilisation of workers operating around the clock to keep Scotland’s transport network moving in the face of further snow and freezing conditions. The Minister also called on the public to help ease the situation by avoiding unnecessary journeys while clearance operations continued across the country. “Winter maintenance on the trunk road network is monitored and managed 24/7 and Traffic Scotland is continuing to work in tandem with emergency services to keep Scotland moving as we witness significant snowfalls and freezing temperatures. “Salting across the network was being carried out overnight and will continue throughout the day with 2,500 tonnes of salt already spread on the trunk roads. “In order to relieve the pressure on the roads, particularly at this busiest of times, it’s important that travellers should plan before making essential journeys and check forecasts, listen to the radio and consult transport websites to allow them to make reasoned judgments about travelling. Banff & Buchan MSP Stewart Stevenson and MP Alex Salmond have welcomed the latest announcement by Awards for All, which sees four organisations sharing over £23,000. Awards for All Scotland is supported by the Scottish Arts Council, sportscotland and the Big Lottery Fund who award grants of between £500 and £10,000 for people to take part in art, sport, heritage and community activities, and projects that promote education, the environment and health in the local community. “This is fantastic news that these organisations within the Banff and Buchan constituency have been successful. “The money awarded will help in a wide variety of ways and will ensure that the successful organisations will go from strength to strength providing value to the communities they serve." “I would urge other organisations in Banff & Buchan to apply for similar award schemes, the benefits of which can help new and existing projects alike. First Minister Alex Salmond today described the result of the Copenhagen climate change summit as a missed opportunity in the ongoing battle to counter global climate change. Mr Salmond said: "Copenhagen was a tiptoe forward when what the world required was a giant leap. "Recognition of a non-binding accord is a long way from a legally binding agreement, and in that sense the summit has exposed a failure of leadership when faced with a great global challenge. "The task is now to ensure that Copenhagen represents only a missed opportunity and not the last opportunity, and to inject the urgency that is needed will require people power and mobilisation of concern to bring the political leaders on board for a binding agreement in Mexico next year." "Scotland can hold its head up high, not just at having the most ambitious climate change legislation in the world, but at having the determination to implement our targets and, in our new agreement with the Maldives, demonstrating a commitment to reach out to the countries at the sharp end of climate chaos and in the interests of climate justice. "There will be widespread disappointment at the lack of progress in Copenhagen, but instead people internationally should turn to focus on the COP 16 summit next year in Mexico, to turn an accord into a binding agreement. We now have to turn to people power after the faltering accord at Copenhagen. "It is noticeable that those progressive politicians in Copenhagen were those representing nations, cities and territories who were all prepared to make the binding commitment that state leaders failed to agree. It seems that with climate change the closer politicians are to the people the more willing they are to act." Passengers travelling to and from Dunbar are set to receive a boost next year with the planned introduction of additional services connecting the town with Edinburgh. Transport Scotland is working with ScotRail to introduce new Monday-Friday services from May 2010. Under the proposal, which is subject to confirmation under standard industry procedures, passengers would be able to travel to Dunbar from Edinburgh at 1000 and 1421, and in the opposite direction at 1057 and 1504. A late evening service from Edinburgh to Dunbar would run at 2200 or later Monday to Thursday. From December 2010, ScotRail is expected to also begin running the 2304 Edinburgh to Dunbar on a Friday. Transport Scotland is negotiating the introduction of all of the new services as part of the deal to extend the ScotRail franchise with FirstGroup, which was signed in April 2008. Transport Minister Stewart Stevenson said: "More people are switching to more sustainable modes of transport and these new services would provide further opportunities for passengers to travel between Edinburgh and Dunbar by rail. “We are working hard to ensure communities along the east coast and across Scotland can benefit from access to the rail network and are investing significantly in extending services – both in terms of expanding infrastructure and plugging gaps in the timetable. A joint Transport Scotland and ScotRail study of the benefits of an hourly Dunbar to Edinburgh service will be undertaken in the near future, and will also consider options between Edinburgh and Newcastle. The feasibility study will consider services from Edinburgh to Newcastle, Edinburgh to Berwick and the possibility of new stations at East Linton and Reston. The study is expected to take no more than a year to complete and ScotRail will appoint consultants to undertake the study in the near future. A £6.5 million project to improve access to and from Scotland’s vital west coast ports has moved a step closer with the selection of the contractor to build the 2.3km A75 Cairntop to Barlae scheme. Transport Minister Stewart Stevenson today announced that RJ Macleod will build the Transport Scotland funded project, which will deliver a 2.3km stretch of dual carriageway in each direction on one of the main trunk roads serving Stranraer and Cairnryan ferry ports. "The selection of the contractor to build this scheme is good news for all road users who use this route and is yet another example of our continuing investment in Scotland’s transport infrastructure. "The Scottish Government has recently invested £29m on improvements to the both A77 and A75 trunk roads and has earmarked a further £60m of planned investment in eight projects which will develop both routes further. "The A75 is a vital artery to and from our ferry ports in the south west of Scotland and this new contract award - which will support 30 jobs during construction - will provide extra overtaking opportunities and improve traffic flow along the length of road. This will have substantial benefits for all traffic – in particular freight and tourists. "I’m delighted to announce the selection of the contractor and that the project will soon be moving to construction. Our commitment to improved links across Scotland is clear and the undoubted benefits to be reaped will be felt by communities and businesses along the route and beyond." The scheme will see a new eastbound carriageway constructed, utilising the line of a dismantled railway line. The existing A75 carriageway will subsequently become the new westbound carriageway. Works on the A75 Cairntop-Barlae scheme are expected to begin early in the new year. "I have been heartened by the manner in which local authorities across the country have worked with this Government to reverse decades of decline in council house building. "Increasing council house building will add to the record number of affordable homes being built across Scotland this year, which helps keep the economy moving by safeguarding jobs and supporting the construction industry. "Council homes can be the first step on the housing ladder for many people and offer security for others. With the end of right to buy for new build housing and new tenancies we know that investment in new housing now, will last long into the future." The Scottish Government will set out its world-leading approach to tackling climate change tomorrow (Monday) as the crucial second week of negotiations at the Copenhagen summit begins. First Minister Alex Salmond and Climate Change Minister Stewart Stevenson will be in Copenhagen this week to promote Scotland’s world-leading climate change targets and to press for a similarly ambitious global agreement at the United Nation Climate Change Conference. Stewart Stevenson will deliver a keynote speech during a day of events and discussions focusing on Scotland’s contribution to the global debate. A key contributor will be Mary Robinson, former UN Human Rights Commissioner, who will call on governments to deliver a fair, ambitious and binding deal in Denmark. On Tuesday, the First Minister will sign a joint-statement with The Maldives President, Mohamed Nasheed, which will outline plans to work together to combat the global threat of climate change. This meeting will form a partnership between Scotland - a leader in international best practice on climate change - and The Maldives, which is one of the countries most vulnerable to rising sea levels through global warming. “Legislation alone won’t bring about the move to a low carbon economy and therefore this Government is taking action which will lead to real changes in everyday actions. Scotland’s Low Carbon Emission event at Copenhagen will draw on the support of businesses; the public sector; voluntary and community groups; and civic society, including the conference on human rights and climate justice held in Glasgow last month. The Low Carbon Mission will also include addresses from key representatives from Scottish society, as well as leading speakers on climate change. Participants include Ian Marchant, Chief Executive of Scottish and Southern Energy and head of the newly-formed 2020 Climate Change group; Jane Wood, Chief Executive of Scottish Business in the Community; Professor Alan Miller, Chairman of the Scottish Human Rights Commission; Duncan McLaren of Stop Climate Chaos Scotland; Ibnu Najib, British Council Climate Advocate, Indonesia; Dr Conor Snowden, Senior Climate Change Adviser, British Council; Duncan Botting, Executive Chairman, Scottish European Green Energy Centre; Paul Lewis of Scottish Enterprise, Boudewijm Poelmaan, Chief Executive of People’s Postcode Lottery; Prof James Curran of SEPA. A special visitor has delivered some Christmas spirit to Banffshire's army of postal workers during thei busiest time of the year. Banff and Buchan MSP Stewart Stevenson turned up on an early-morning visit with a real winter warmer - a bottle of Scottish Parliament whisky. But while the hard-working mem and women of the Royal Mail could be forgiven for enjoying a dram during a well-earned rest, not a drop touched their lips. Staff at the Banff delivery office will instead use te gift from Mr Stevenson to raise money for charity. Mr Stevenson popped into the office early on Friday morning to pass on his encouragement to the postal workers as they battle with huge sacks of Chistmas mail. He was shown round by delivery office manager Ian Jackson, and met the men and women who have the task of getting the huge volumes of additional mail through letterboxes. "Christmas is the busiest time of the year. Our people do really pull out all the stops throughout the year to ensure mail is delivered quickly, but even more so over the busy festive period, so we were pleased that Mr Stevenson came along to witness the hard work that goes on behind the scenes. "The postal staff do a fantastic job at this time of year to ensure that friends and families stay in touch through their Christmas greetings and gifts. "And as usual, we urge our customers to post early so that friends and family have longer to enjoy their Christmas greetings." Although no figures are available solely for the Banffshire area, Royal Mail believes that the Christmas post bag across Scotland this year will amount to 200 milllion items. "It was great to meet the hard-working Royal Mail postmen and women at Banff delivery office and to see at first hand just how much effort they put into delivering for people at this time of year. "Posties do such an important job at this time of year and I like to thank them for their efforts and wish them all the best over the busy festive period." STEWART STEVENSON GIVEN BACKING OF PARLIAMENT TO STATE SCOTLAND'S CASE. Scotland's climate change minister has been given the full support of parliament to take Scotland's emissions targets to Copenhagen to inspire the rest of the world to take action. "We are a nation with a record of supporting others in their development which is why we are taking the Scottish example to Copenhagen - to lead and inspire others to action. Legislation alone won't bring about the move to a low carbon economy and therefore this Government is taking action which will lead to real changes in everyday actions: by businesses; the public sector; voluntary and community groups; and individuals. As further evidence of Scotland's commitment to respond to our global responsibilities on climate change, the Minister also announced that the Scottish Government will be establishing a number of Fellowships to allow talented individuals from Commonwealth countries to come to Scotland to share in our cutting edge knowledge on climate change adaptation and mitigation. The 2014 Climate Change Saltire Fellowships will fulfil a commitment made as part of the Commonwealth Games bid to set up a carbon emissions reduction fund. "The Fellowships will be targeted at climate change mitigation and adaptation measures in Commonwealth countries, particularly those least able to deal with the impacts of climate change. We believe there is a tremendous opportunity to assist Commonwealth countries through transferring relevant expertise in knowledge and skills transfer in areas where Scotland is strong, such as carbon capture and storage and community action on climate change. The Fellowships will bring direct and lasting benefits to Commonwealth countries through reducing emissions or assisting adaptation in a way that best meets local circumstances and there will also be benefits to the Scottish economy and to the economies of Commonwealth countries through the exchange and application of climate change knowledge." The Minister also announced a new alliance to progress the work being done on low carbon development. He said that a range of Scottish organisations from across industry, government, academia and civil society are to join together to co-operate with the efforts of the UK and the EU in establishing this global framework for low carbon energy supplies. "This partnership will work together to support these international efforts through offering expertise and capacity and to pull together packages for funding support where necessary. Assuming that the UNFCCC process is able to agree a legal and financial framework for low carbon mitigation and adaptation actions in developing countries during 2010, this Scottish partnership stands ready to work with the UK and our European and global partners on a series of practical actions to deliver on this." The process of identifying the contractor who will build and maintain the new rail link to the Borders is now under way. The notice for the construction has been submitted for publication in the Official Journal of European Union (OJEU) by Transport Scotland, the Scottish Government agency in charge of the scheme. The milestone has been reached in a project which forms a key part of a programme of investment in Scotland’s road and rail networks which will help promote the Scottish Government’s objective of sustainable economic growth. The Minister for Transport, Infrastructure and Climate Change, Stewart Stevenson said. “The Scottish Government has made clear its commitment to this key part of our programme of investment - we are now delivering on that commitment. “A fast, efficient rail link connecting communities from the Scottish Borders to Midlothian and Edinburgh will act as a catalyst for economic growth right across southern Scotland, supporting hundreds of jobs during its construction. And a new link will increase business development and housing opportunities, and help promote inward investment. “I will be stating Scotland’s case on climate change at Copenhagen next week and a rail link through the Scottish Borders to Edinburgh will also help us meet our commitments to the environment. The link will contribute to Scotland’s reduction in carbon emissions whilst providing opportunities to make the switch from car to train. This will help tackle congestion along the A7 and A68, in turn reducing the number of road accidents on those routes. All the required land has been acquired to allow construction of the railway. Accelerated funding was made available last year to allow advanced works to be completed early to reduce the level of risk in the main works contract. It is anticipated that the construction contract will be awarded in Autumn 2011. Banff & Buchan MSP Stewart Stevenson has expressed his frustration at the UK Government’s refusal to accelerate capital spending and the impact it will have on Peterhead. Accelerated capital spending last year was a vital part of the economic stimulus needed to combat the recession, but the UK Government has refused to repeat the measure this year despite stimulus packages continuing in other countries. Accelerated capital spending this year could have allowed work to begin on the £2.2 million Peterhead Energy Industry Park, as identified by First Minister Alex Salmond during First Minister’s Questions today (Thursday), and funded the construction of social housing and other projects across Scotland. “It is extremely disappointing that the UK Government has chosen to put the prospect of economic recovery at risk through their refusal to accelerate capital spending. The UK Government’s failures risk prolonging the recession and continuing to hurt hard working families that are struggling to cope. “It is particularly frustrating for people in Peterhead given that they could have directly benefited from having the funding for the Energy Industry Park available immediately. Scottish Transport Minister Stewart Stevenson yesterday (Tuesday 8 December) launched the new hybrid Strathclyde Partnership for Transport (SPT) Mobile Travel Centre at the Scottish Parliament. The vehicle - owned and operated by SPT - is the first of its kind in the UK and demonstrates the organisation's commitment to leading the way in hybrid bus technology with anticipated 33% fuel savings. Carbon dioxide emissions will also be reduced by at least a third. Launching the new vehicle, Transport Minister Stewart Stevenson said: "I'm delighted to launch this new Mobile travel centre, the first of its kind in the UK. This is a hugely positive initiative, which not only utilises the latest green technology in the bus industry, but also promotes public transport as an alternative to the car to local communities in Glasgow and the west. "If we are going to achieve our ambitious climate change targets, we need to cut emissions from transport and projects such as this can make an important contribution to these efforts." Built around a bus chassis, the new £205,000 Mobile Travel Centre is powered by diesel hybrid technology. This means that while it still has a diesel engine, this is only used to charge the electric batteries that drive the vehicle. The batteries are also used to provide power within the vehicle, making electrical appliances such as computers and TVs self-sufficient. The Mobile Travel Centre is one of SPT's most popular initiatives. It provides people in rural areas with information on local rail and bus services, express and long distance coach services, short stay breaks and local ferry services - helping to Join up Journeys across various transport modes. David Fagan, Vice Chair of SPT, said: "We're delighted to have the Transport Minister launch our new Mobile Travel Centre at the home of Scottish politics. SPT is proud to lead the way for hybrid bus technology and we hope this will encourage commercial operators to trial this type of vehicle. "We have worked very hard to ensure the vehicle is as green as possible with optimum fuel efficiency and a minimum carbon footprint. The Mobile Travel Centre is an important means of providing remote and inaccessible communities with access to public transport information, so it's vital that we have the best possible vehicle." The new vehicle is more adaptable for easier access to remote rural communities, and is low-floored to better suit wheelchair users, those with impaired mobility and prams. It also offers high-speed broadband internet use. A feasibility study commissioned by SPT has shown that the diesel-hybrid technology used on the Mobile Travel Centre can reduce fuel consumption by up to 33%, carbon dioxide emissions by 33%, nitrogen oxide by 38%, and hydrocarbon by 99%. The launch of the new vehicle also means that for the first time visitors to the Mobile Travel Centre will be able to purchase SPT tickets on board. The new Mobile Travel Centre is due to go into service in the new year. Banff and Buchan MSP Stewart Stevenson attended the Carers’ event organised by North Aberdeenshire VSA at the Royal British Legion Hall at Turriff last week. “I am delighted that this event has been arranged and I am pleased to be taking part. Carers deserve our recognition for the work which they do and there will be a range of agencies present on the day to provide advice and assistance to ensure that carers are getting all the help which is rightfully theirs. “Many people don’t get the support they need because they don’t recognise the caring role they have. If you regularly provide or intend to provide care, you need to find out about the help available. The benefits system is complicated and finding out what you are entitled to can be difficult. Claiming benefits usually involves filling out forms. Try not to let this put you off. A local Independent Citizens' Advice Bureau, disability organisation or an Age Concern branch should be able to help you with the forms. The Pension Service (Freephone: 0800 99 1234) should also be able to help you with more information about benefits and completing the claim forms. A series of measures to improve congestion on the A96 through Elgin have been drawn up by Transport Scotland, BEAR Scotland Ltd and The Moray Council. Road users travelling on the A96 trunk road regularly face delays when driving through Elgin, as the road passes through the town centre which is already heavily populated with local traffic. Transport Minister Stewart Stevenson has met with The Moray Council on a number of occasions to discuss how the bottlenecks in Elgin could be resolved. Following these meetings, Transport Scotland and BEAR Scotland Ltd have developed a package of improvements in association with The Moray Council to ease congestion and improve journey times through the town. Structural carriageway maintenance of the A96 between Wittet Drive and Oakwood, including resurfacing and improved pedestrian facilities, is already under way. 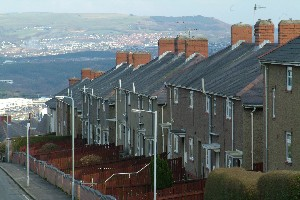 Better use of local roads – such as Reiket Lane for road users travelling south from the east, and Morriston Road for those in the north-west – is also proposed to channel traffic away from the town centre. "Elgin is one of the key economic drivers in Moray and it is vital the town is served by a safe and reliable transport network. "Improving accessibility and connectivity to the town will support the economic growth of the whole region and it is important we resolve the conflict between local and through traffic in Elgin. "I am sure the people of Elgin will welcome Transport Scotland, BEAR Scotland Ltd and The Moray Council working together to resolve these challenges for the benefit of all road users. "I’m confident road users will see a big difference in a short space of time once this programme of work has been implemented." Further works to improve the A96 at Morriston Road, North Street, Linkwood Way and Alexandra Road, and the A941 at Lesmurdie Road have also been identified and will be considered as part of both Transport Scotland and The Moray Council’s investment plans. "Thanks to the Minister for getting all parties together to focus on Elgin’s traffic problems. "This has involved agreement on baseline traffic data and study of the perceived problem areas along the A96 and A941. "None of the areas identified for improvement will come as any surprise to motorists travelling in and through Elgin. What is important is that we have reached a common understanding with Transport Scotland about the key areas that need to be addressed. "Now Moray Council, BEAR and Transport Scotland face common challenges in delivering the agreed improvements within a reasonable timescale." The resurfacing works at Morriston Road being undertaken by trunk road operating company BEAR Scotland include a carbon management pilot scheme which will measure the materials, energy and waste generated by the project as a whole. The pilot project seeks to pre-empt the requirements of the Scottish Climate Change Bill for transport bodies to report on the carbon impacts of their operations and activities. "Inclusion of this carbon management project underlines our commitment and that of Transport Scotland to tackling the issues of Climate Change and sustainability. "This will help us to determine methods of introducing real reductions in carbon usage during future construction projects." The work in Elgin comes in the wake of the appointment of the contractor to construct the Fochabers-Mosstodloch bypass on the A96. Transport Scotland will award the £31.5 million contract to Morrison Construction to build a new 5km stretch of all-purpose single carriageway on the A96, demonstrating the Scottish Government’s commitment to the route. The A96 is used by around 18,000 motorists each day. Climate Change minister Stewart Stevenson is taking the Low Carbon Mission, a world-class event on Scotland's world-leading climate change framework, to the Climate Change Summit in Copenhagen next week. As the world turns its gaze on the deal-making talks this week, Mr Stevenson said it was only right that Scotland, with its world-leading Climate Change Act, should be represented at the summit to set an example to the rest of the world. Mr Stevenson said: “It is only right and proper that Scotland should be setting out our ambitions on the world stage given that our legislation is the most comprehensive anywhere in the world. Although the UK Government has refused to include a Scottish Minister in its official delegation, the Scottish Government will be travelling to the Danish capital to stage its Low Carbon Mission event, with Ian Marchant, Chief Executive of Scottish and Southern Energy, and Mary Robinson, the former UN High Commissioner for Human Rights, among the key speakers. The Minister said: “Legislation alone won't bring about the move to a low carbon economy and therefore this Government is taking action which will lead to real changes in everyday actions: by businesses; the public sector; voluntary and community groups; and individuals. The Low Carbon Mission will be taking place on 14 December in the Mogens Dahl Koncertsal in Copenhagen. Rail passengers across Lanarkshire and the Lothians are set to benefit from a significant improvement in the service linking Glasgow with Edinburgh via Shotts, with journey times slashed by up to 33 minutes. As part of the new winter timetable announced by Transport Scotland, a new hourly service will commence on Monday, December 14, more than doubling the number of journeys on the route. Operated by ScotRail, the new service will stop at Bellshill, Shotts, West Calder, Livingston South and Haymarket, offering a journey time between Glasgow Central and Waverley of 63 minutes, compared to 96 minutes at present. This new service will run between the current hourly all stops service and reduces the need for Lanarkshire passengers heading for Edinburgh to travel via Glasgow. "The new timetable will offer quicker journeys, extra evening services and a more regular departure pattern, delivering major improvements for passengers across Lanarkshire and the Lothians. "We have worked hard to ensure communities across central Scotland can benefit from access to the rail network and these new services deliver a good balance between connectivity and journey times. "These new services demonstrate we are committed to helping more people make the switch away from the private car to more sustainable modes of transport." The service is the first in an ambitious package of improvements between Glasgow and Edinburgh, as identified in the Scottish Government’s Strategic Transport Projects Review. Journey times will also be cut between the principal stations on the route to both Glasgow and Edinburgh and additional services will operate in the evening in both directions, offering a more regular service for passengers. The new services mean 58 train journeys on the Shotts line linking Edinburgh and Glasgow Central compared to the existing 28. "I welcome these increases to services. The enhancements will bring many benefits to our growing number of customers." The A87 at An Coileach is to benefit from £3m of essential road maintenance, Transport Minister Stewart Stevenson announced today. The contract award by Transport Scotland to RJ MacLeod will see reconstruction of the road to strengthen and widen 2.7km of the A87, from Abhainn Ceann Bridge through Sconser to the junction at Kingdom Hall. "I am pleased to announce the award of this contract on a key route connecting Skye to mainland Scotland. "This £3m investment confirms the Scottish Government’s commitment to maintain our national infrastructure, and these works to the A87 will improve road conditions and road safety for both Skye’s communities and visitors." It is expected that the programme of works will begin in January 2010 with a construction period of approximately 12 weeks. The stretch of road, which averages over 2,200 journeys on it per day, was identified for work as it is reaching the end of its expected life service. Eight of the world’s most respected construction and specialist engineering companies have been invited to tender for the principal contract to build the landmark Forth Replacement Crossing. A total of 39 companies expressed an interest in becoming involved following publication of the contract notice in June this year. A final eight, who submitted pre-qualification questionnaires indicating their financial and technical capabilities, have consolidated into two consortia and will be formally invited to bid for the work. Vinci, Balfour Beatty, Bam Nuttal and Morgan Est have formed the Forthspan consortium, while the Forth Crossing Constructors group comprises Dragados, Hochtief, American Bridge International and Morrisons. Transport Minister Stewart Stevenson said: “The Forth Crossing Bill has just been introduced to Parliament and the issuing of the formal invitation to tender demonstrates that delivery of the Forth Replacement Crossing remains on schedule. “The long-term future for the existing Forth Road Bridge remains uncertain and it is vital we act now to preserve cross-Forth travel and ensure sustainable economic growth for communities across Scotland continues in the future. “The construction industry has already signalled its enthusiasm for this project and we look forward to receiving high quality bids from some of the biggest and most experienced construction companies in the world. “We are determined this project should provide a value-for-money solution and we are confident it compares favourably with other similar structures across the world. It will be funded directly by the Scottish Government from existing capital budgets, ensuring best value for the taxpayer." The companies comprising each of the consortia have an excellent track record in delivering high profile bridge projects across the globe. Forthspan’s experience includes delivering for the 2004 Athens Olympics the £655m Rion Antirion Bridge, a 2.8km cable stayed bridge linking the Pelopannese Islands to mainland Greece, and the £330m Second Severn Crossing completed in 1996 which carries the M4 over the River Severn between England and Wales. Forth Crossing Constructors experience includes completing construction in 1999 of the £768m Oresund Bridge which forms part of the Oresund link connection between Denmark and Sweden, and are currently undertaking the replacement of the seismically vulnerable eastern span of the San Francisco Oakland Bay Bridge, at a contract value of around £1bn. Both consortia will enter into dialogue with Transport Scotland over the next year to discuss their proposals for the project. Participants will be invited to submit a final tender by late 2010, outlining firm proposals and price. It is anticipated the award of the Forth Replacement Crossing contract will be made in spring 2011 and construction is expected to begin later that year. The contract, which is anticipated to be priced between £900m and £1.2bn in today’s prices, includes detailed design, construction of the main crossing and approaching roads. an Intelligent Transport System (ITS) including gantry displays to inform drivers of new variable speed limits. A separate procurement exercise will be undertaken later for two separate, smaller contracts associated with the scheme but which will be delivered early in the project programme. These will see Junction 1A on the M9 upgraded and ITS provided on the M9 Spur south to Newbridge, as well as ITS provided in Fife from Admiralty Junction to Halbeath. The Forth Replacement Crossing scheme was announced to Parliament in December 2008 and will utilise the existing Forth Road Bridge to carry public transport, motor cycles less than 50cc, pedestrians and cyclists. This has resulted in an estimated saving of around £1.7bn on the original estimated cost of the scheme and provides a sustainable increase in capacity to meet future demand. The new crossing is expected to be open to traffic in 2016. Transport Scotland have been holding a series of local public exhibitions at North Queensferry, South Queensferry, Kirkliston and at the Holyrood Hotel in Edinburgh. These feature leaflets, maps, new artist impressions and a Virtual Reality Model (VRM) of the scheme, as well as information on the Parliamentary Bill and supporting environmental documentation. The introduction of the hybrid Bill – the first of its type ever taken forward in Scotland - begins the first of three parliamentary stages running in parallel with the procurement process. It is anticipated Parliamentary scrutiny of the Bill will be completed by November 2010. The deadline for applications for cash from a new £1 million fund to help create new businesses and premises for community projects has been set for 1 February 2010. The Stations Community Regeneration Fund (SCRF) was launched by Transport Minister Stewart Stevenson in May this year and has been created to bring redundant or disused station buildings back into use for the benefit of passengers or the local community. Funding is available from Transport Scotland to contribute towards the costs of structural repairs and to provide up to 50% of the costs of fitting out station premises for their intended use. Applicants with new business ideas or projects which benefit rail passengers or the local community are invited to apply for a funding contribution. The fund has already received strong demand from businesses and community groups around Scotland since its launch and Transport Scotland is keen to hear from more groups or organisations seeking funding. "The Stations Community Regeneration Fund has already received some excellent applications and we want to ensure everyone has the chance to access this money. "Targeted investment like this can lead to a real improvement in the station environment by bringing redundant buildings back into use, new employment opportunities can be opened up and communities benefit through the creation of new local facilities. "The deadline is now looming and we would encourage anyone still interested in accessing funding to pull their application together soon." The Stations Community Regeneration Fund will be managed and administered by ScotRail with applications being evaluated by Transport Scotland. Funding for the scheme has been made available following the decision to extend the ScotRail franchise with FirstGroup until 2014. Anyone seeking more information should contact ScotRail at SCRF@firstgroup.com or by telephone on 0845 601 5929. The scheme is one of 28 initiatives which will benefit from an investment fund of more than £70 million, managed by Transport Scotland, which has been created to improve Scotland's railways. WHY DO 17 BABIES DIE EVERY SINGLE DAY IN THE UK? 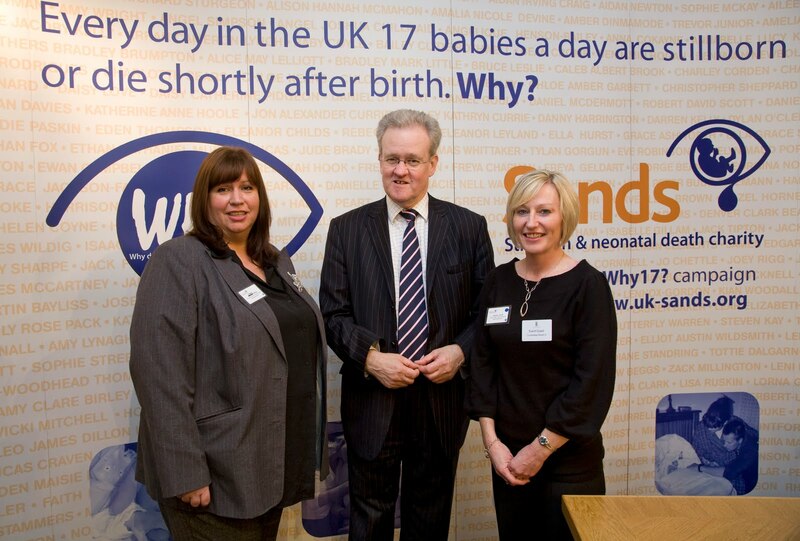 Sands, the stillbirth and neonatal death charity, held the reception at the Scottish Parliament on 18th November 2009, to raise awareness of the 17 babies who are stillborn or die shortly after birth every day in the UK. The figures for Scotland are no less shocking; almost every day a baby is stillborn in Scotland and a further 3 babies die shortly after birth every week; this is nearly 500 babies dying every year in Scotland. 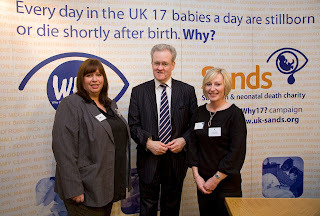 At the event, Stewart Stevenson was presented with Sands’ report, Saving Babies’ Lives Report, 2009 which, backed up by new research, highlights several problem areas that are contributing to this level of baby loss, the long-lasting impact of these deaths, and recommends changes that could save babies’ lives. 325 babies were stillborn in Scotland during 2008 – that’s 1 in every 200 babies born in Scotland. The stillbirth rate has not changed significantly since the 1980’s. 168 babies died within four weeks of their birth in 2008 in Scotland - 122 within the first seven days of their lives. Scotland has one of the highest perinatal mortality rates in Europe (babies who are stillborn or die within the first 7 days of life). Mortality is highest in city areas with the worst social deprivation and poorest general health indicators. Ten times more babies are stillborn than die of cot death every year in Scotland. More than 60 ScotRail trains will start switching routes from September 2010 following the arrival of new electric trains in Ayrshire and Inverclyde. The Transport Scotland investment in 38 new electric Class 380 trains will add 9000 seats to the Scottish rail network. You need Flash Player 8 or higher to view this content. From Ayr in the west to North Berwick in the East, customers will see benefits from the planned ‘cascade’ of different types of trains. Ayrshire and Inverclyde passengers will be the first to gain, with the Class 380 trains arriving from September 2010. In December that year, trains will once again run on the Airdrie to Bathgate rail line, with new stations created, others upgraded and existing single rail track double tracked and electrified. The link will offer new services between Edinburgh and Glasgow, including direct services from Helensburgh/Milngavie to Edinburgh served by Class 334 trains. And from March 2011 Edinburgh - North Berwick services will also be served by new Class 380 trains. “We are delighted to see the progress being made by Siemens towards the delivery of the Class 380 rolling stock. Banff & Buchan MSP Stewart Stevenson has welcomed Alanah Ironside (9) and Lisa Baxter (10) to the Scottish Parliament to receive prizes from the SCARF calendar awards. The two pupils attend Bracoden Primary School in Gamrie and were amongst the thirteen winners from schools across the North East of Scotland. The SCARF Calendar Awards saw around 4,000 entries this year from school pupils who designed calendar entries that will encourage people to be more energy efficient and environmentally friendly. 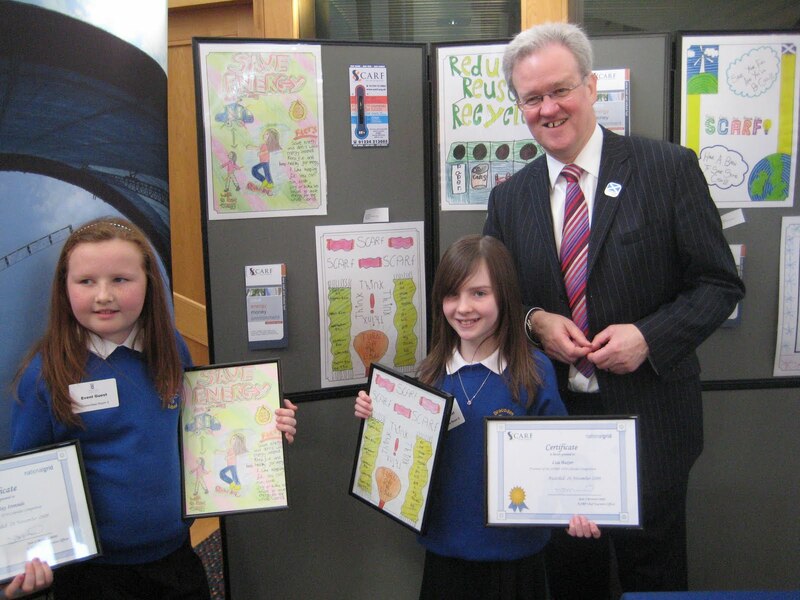 The winning entries were voted for by North East MSPs at an event held earlier in the year. 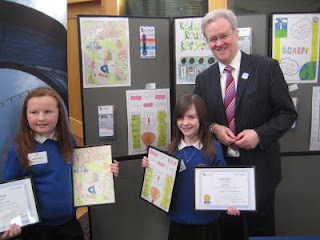 “I was delighted to meet Alanah and Lisa during their visit to the Scottish Parliament and to see them win the awards that their artwork so clearly deserves. They were both extremely impressive entries and worthy winners. “I know that their parents and teachers will have been delighted at their success and it is extremely encouraging that pupils at Bracoden Primary School clearly care deeply about the environment. Banff & Buchan MSP Stewart Stevenson has welcomed the announcement of a further £9.3 million package for the Scottish fishing industry under the European Fisheries Fund. This takes the total level of funding from the fund over £25 million for 2009 and sees significant funding for fishing and processing businesses in Banff & Buchan. The funding includes £381,953 for Mapco Ltd in Peterhead towards refurbishing their processing building and installing fish drying, refrigeration and packaging equipment and £73,256 for Fraserburgh Freezing & Cold Storage Ltd towards purchasing and installing a blast freezer. The funding also contains assistance for young skippers to buy a share of their vessels. “It has been a difficult time for many in Banff & Buchan’s fishing and fish processing industries recently with the economic climate and tough fishing restrictions combining to damaging effect. “However, I welcome this latest round of investment that takes the total for the year to more than £25 million. It is clear evidence of the importance that the SNP Government attaches to our fishing industry and our determination to support it through the difficult times. “Encouraging more young skippers into the industry, and helping to fund measures to maximise the profitability of all those involved, are steps that will help secure the future of the industry. Banff & Buchan MSP Stewart Stevenson has welcomed the news that TWMA’s base in Peterhead has won a green business award for the development of its TCC Rotomill product. TWMA is an industry leader in the handling and treatment of hydrocarbon-contaminated drill cuttings and waste materials. The award was one of eight given to Scotland’s most environmentally friendly businesses at the tenth Vision in Business for the Environment of Scotland (VIBES) awards in Edinburgh on Tuesday night. “Businesses have a key role to play in protecting our environment, through the development of practices and products that are both environmentally friendly and profitable. “I am delighted that TWMA has had its efforts recognised and been awarded one of these prestigious awards. Being environmentally friendly provides important economic opportunities as well as challenges for businesses, something that TWMA has clearly recognised. Transport Minister Stewart Stevenson welcomed fifteen young people on the road to career success today as they were formally inducted to an M74 Modern Apprenticeship scheme. The apprentices, who are mainly from the Glasgow and South Lanarkshire area, started working on the project last year as a result of the M74 Employability Partnership. They will now have the opportunity to maximise the benefits of this work experience as they start out on the Interlink M74 JV led Modern Apprenticeship scheme that allows them to become 'time-served' within two years. "The M74 Completion project is playing a vital role in providing employment for the construction industry in a period of economic difficulty, around 900 jobs at the project’s peak. Supporting and developing young people is a key part of this and I am delighted with the ways in which Interlink has proactively developed training opportunities for these young people and ensured their training will continue beyond the M74 Completion project. "Not only will these Modern Apprenticeships provide the candidates with a strong starting point for their careers, the valuable experience and transferable skills they will gain as a result will stand them in excellent stead for the future. "Transport Scotland's work alone supports over 25 per cent of the civil engineering contracting sector's workload in Scotland. Access to skilled employees is key to the success of our major infrastructure projects and investing in our people through programmes such as the Modern Apprenticeships is essential, not only to meet current needs, but also to ensure ongoing sustainable economic growth for Scotland." The scheme, which has been developed by contractor Interlink M74 JV in conjunction with Construction Skills, will offer real employment opportunities for all fifteen involved. "I am very proud of the role we played - along with Interlink, the Glasgow East Regeneration Agency and our local government partners - in establishing the M74 Employability Partnership. "That project has given these young people the skills and opportunity to secure Modern Apprenticeships on the biggest engineering project in the country and support from Interlink in forging long and successful careers in a great industry." "This is a fantastic day for the civil engineering industry as employers have been working for a number of years to put these apprenticeships in place; all candidates will be registered with Scottish Building Apprenticeship Council. We at Interlink are delighted to show faith in the future of the industry and the young people of the Glasgow and surrounding areas." The Apprenticeships will cover key construction roles such as formwork, steelfixing, plant operation and general construction. The young people will serve their time with one of the four joint venture partners and remain there to complete their apprenticeship after the new M74 is open in 2011. The M74 Completion project – one of the largest infrastructure schemes currently on the ground in Scotland - is a key part of the Scottish Government's current £2.5 billion programme of investment in transport infrastructure over the next three years. The scale and nature of the scheme allows the contractor to develop a Modern Apprenticeship programme that covers a diverse range of construction skills. Completing the M74 from Carmyle to the M8 will return significant benefits to Scotland and its businesses by offering a quicker, safer and more efficient route to get their goods to market. The project will also reduce congestion in and around Scotland's largest city and capture the long term economic benefits that the Commonwealth Games will bring in 2014. Local MSP Stewart Stevenson has met with NHS Grampian Chief Executive Richard Carey to discuss concerns over the continued closure of the Fraserburgh Birthing Unit. Mr Stevenson was joined at the meeting by SNP Westminster candidate for Banff & Buchan Eilidh Whiteford. 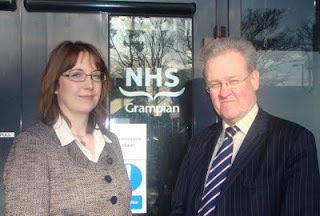 When NHS Grampian proposed closing the maternity unit at Fraserburgh in 2005, Mr Stevenson joined local campaigners on a march in Fraserburgh and met them at the Scottish Parliament when a delegation travelled down to hand in a petition to the then Health Minister, as well as raising the matter in Parliament, meeting with Ministers and speaking at Parliamentary Committees on the subject. In addition, Mr Stevenson travelled to the Isle of Skye to view the highly successful birthing unit in Broadford and suggested to NHS Grampian that this be considered as an alternative to closure, a move which was ultimately adopted. “This was a very useful meeting with Mr Carey. I expressed to him the deep concern that exists locally about not only the closure of the birthing unit but also its future. This is a much-valued facility, as was made very clear by the community-led campaign to save the facility and its future must be secured. “I was very pleased to receive that assurance from Mr Carey and his senior officials who attended the meeting. Mr Carey made it clear that NHS Grampian remains committed to the long-term future of the birthing unit in Fraserburgh, having spent several hundred thousand pounds setting up the facility. “The key in all of this seems to be the vacant post of Team Leader at the Unit. This is now being advertised nationally in order to attract the right calibre of applicants. Mr Carey was at pains to stress that the Team Leader must be safe and effective in clinical practice as patient safety is – quite rightly - of the highest importance given Fraserburgh’s location as over an hour away from ARI. “Given the long struggle to save this facility for the Broch, it is quite understandable that people are suspicious when they see that the birthing unit has been closed for this length of time. “I am very pleased at the commitment which our MSP has secured from NHS Grampian. A £2.2m bridge upgrade on the A82 is set to get underway following the award of the works contract for the Ba Bridge replacement Transport Minister, Stewart Stevenson, announced today. Transport Scotland has awarded the contract to RJ MacLeod, who will undertake replacement of the existing narrow sub-standard bridge with a new modern and safer structure. "This Government is committed to investing in improvements on the A82 and this project is just one of a number of upgrades scheduled for the A82 in the coming months. "This vital work will improve road conditions and safety on the A82 as well as improve transport links to northern Scotland and our island communities. "This announcement underpins this Government’s commitment to implementing the A82 route action plan, including measures such as road widening at selected locations between Tarbert and Inverarnan and between Corran Ferry and Fort William, as well as climbing lanes and overtaking lay-bys, road alignments, junction improvements, and hard strips." The works are expected to start in January 2010 and take 12 months to complete. A temporary road and bridge will be established adjacent to the existing route to allow traffic to continue to use the A82 while these works are being undertaken. Due to the location of the bridge within an environmental conservation area, extra care is being taken to plan these works in harmony with the diverse local ecology. A mixture of safety, maintenance and project improvements are proposed for the A82 over the coming year. Some of the intended works for the route include verge safety fencing between Tarbet and Fort William, traffic signal improvements at Inverlochy Junction, a lighting replacement scheme at North Road, Fort William, and additional bridge strengthening and minor bridge works on a number of crossings along the route. Banff & Buchan MSP Stewart Stevenson has welcomed the announcement of a new public social partnership that will see Aberdeenshire Council, the private sector and Cornerstone work together to review the design and delivery of support services for people with learning disabilities within their community. The partnership is one of 10 pilot projects across Scotland, another two of which are in the North East. The Public Social Partnership (PSP) Project is designed to improve service delivery and maximise competition by ensuring that the third sector is involved appropriately in the design and commissioning of public services in Scotland and that procurement mechanisms are accessible to the third sector. Specialists from PricewaterhouseCoopers LLP (PwC), Forth Sector Development and the Scottish Government will provide advice and support to help 10 partnerships between the third and public sectors design and deliver a wide range of enhanced services to their communities. “Cornerstone already does important work with people who have learning disabilities in Banff & Buchan and it is excellent news that this partnership will help to ensure that their service is of the highest possible quality. “This kind of collaboration between the public, private and charity sectors is an important way of improving the services that an organisation like Cornerstone can offer and I know it will be welcomed by those who will benefit from that partnership. "Your old folk shall dream dreams and your young shall see visions." It was a consequence, Joel wrote, of God's spirit being poured out on people. I think that I have crossed the age threshold to be a dreamer rather than a visionary. I know that because of the "Grumpy Old Men" and "Grumpy Old Women" books. Their introductions say that the age range of the grumpies is 35 to 54. Although that seems somewhat arbitrary, I am encouraged to think that there might be something in it and that in two years my offspring might find me returning to being a benign, mild-mannered minister rather than a spleen venter. I for one am not holding my breath and in any case I am sure that there are plenty of examples in this place of post-54-year-old grumpies to underline the nonsense of the quoted age range. However, I like to dream dreams and I like to think that even visions are not beyond me. I serve a church that came about because old and young had dreams and not a few visions of long-established denominations becoming united. In 1972, the Congregational Church in England and Wales and the Presbyterian Church of England united as a sign of reconciliation and wise insight. The harder job would have been to justify those churches staying apart. Two further unions later, the United Reformed Church now has an established presence in Scotland. Not that those unions have been without tension, but such creative tension as resulted engaged hearts and minds to find ways of being that respected the distinctiveness of the constituent denominations while celebrating the common purpose: a sign of peace to a divided world. In the much-lambasted Monty Python film, "The Life of Brian", during the delivery of the sermon on the mount, when Jesus says, "Blessed are the meek for they shall inherit the earth", one of the crowd says, "Oh, it's blessed are the meek! Oh, I'm glad they're getting something—they have a heck of a time." Amusing though that is, it hints at a common misunderstanding of the biblical concept of meekness. It is not weakness but controlled strength—like the definition of a gentleman being a bagpipe player who chooses not to play. I am a piper, so I can say that. Justice and peace come not through fearful inaction but through wise and compassionate response to the creative tension that wrestling with such issues inevitably brings: a meekness that strongly strives for reconciliation and renewed hope in an often-divided and wounded world. As Lennon—John Lennon—said, "Maybe I'm a dreamer", but at least in two years I will not be grumpy. Local MSP Stewart Stevenson and SNP Westminster candidate for Banff & Buchan Eilidh Whiteford have condemned the UK Government’s empty words on supporting the development of carbon capture and storage (CCS) technology after a commitment to bring forward legislation to “support carbon capture and storage and to help more of the most vulnerable households with their energy bills” was made in the Queen’s Speech. The UK Government has promised such support regularly since 2005, yet its lack of support for developing the technology in Peterhead meant that the vital project there was lost to Abu Dhabi in 2007. “The UK Government may have again offered warm words when it comes to developing vital carbon capture technology, but people in Peterhead have seen first hand just how empty those words have been in the past. “Peterhead could have been leading the world in the development of the technology, with all the economic and environmental benefits that would bring, but the UK Government’s dithering and delay 2 years ago meant that the project was transferred to Abu Dhabi." Banff & Buchan MSP Stewart Stevenson has welcomed the publication of figures showing that 96.4% of cancer patients in NHS Grampian were treated within the 62 day target between April and June this year. This is the highest percentage for NHS Grampian since the target was first introduced in 2005 and compares with a figure of 87.2% in April-June 2007 when the SNP Government was first elected. NHS Scotland’s target is for 95% of cancer patients to be treated within 62 days, a target that has been met nationally in each of the last 3 quarters. “I am delighted by these latest improvements to waiting times for cancer patients in the NHS Grampian area and believe it is a real testament to the determination of NHS Grampian staff to continually improve the vital care that they provide. “The Scottish Government is preparing to set tougher targets for cancer care from 2011 in order to keep driving improvement forward, but I am confident that staff in NHS Grampian will continue to be tireless in their efforts to provide the best care possible for their patients. “That NHS Grampian has seen a 9.2% improvement since the same period in 2007 when the SNP first took office is excellent news and reflects progress that is being made across Scotland. Banff & Buchan MSP Stewart Stevenson has welcomed the announcement that the Scottish Government is to provide Aberdeen’s Macaulay Land Use Research Institute with £60,000 towards its UR-flood project. The UR-flood project aims to improve planning for floods within Government, environmental organisations and individual households so that people are better prepared when they occur. “The North East has been hit hard by flooding recently so I welcome anything that will help improve planning for such events in the future. The research will rightly look at how prepared individual households are for floods, as well as environmental organisations and Governments, and I think this is an important approach to take. “Identifying ways that individuals and communities can better respond to flood warnings is vital if the kind of devastation we recently saw is to be limited in the future. The most significant Scottish transport infrastructure project for a generation has reached a historic stage as it goes forward for scrutiny by the Scottish Parliament. The introduction of the Forth Crossing Bill, which seeks authority to implement and build the new Forth Replacement Crossing (FRC), marks the start of a period where individuals and other parties who may be affected can review full details of the scheme and have the opportunity, should they wish, to lodge objections. Significant doubts remain over the future viability of the existing Forth Road Bridge, and the £1.7bn - £2.3bn (at 2016 prices) project is aimed at maintaining and improving the vital economic transport corridor across the Forth. “Introduction of the Forth Crossing Bill marks a historic day for Scotland and makes this Government’s commitment to delivering the Forth Replacement Crossing in 2016 on time and on budget abundantly clear. “Given the real uncertainty of the future viability of the current Forth Road Bridge, Scotland simply cannot afford any delay to the FRC. The Forth Replacement Crossing project seeks to construct a motorway-standard two lane carriageway with hard shoulders, spanning approximately 2.7km in length, comprising a cable-stayed bridge with three "mono-towers", two central spans of approximately 650 metres each and approach viaducts, as well as trunk road connections north and south of the bridge. The bridge and connecting roads will also include ITS (Intelligent Transport Systems) technology to manage and smooth traffic flow via variable speed limits. Along with improved junctions and wind shielding, the Forth Replacement Crossing will significantly improve the reliability of the cross-Forth travel for vehicles. The scheme, announced to Parliament in December 2008, will utilise the existing Forth Road Bridge to carry public transport, motor cycles less than 50cc, pedestrians and cyclists. This has resulted in an estimated saving of around £1.7bn on the original estimated cost of the scheme and provides a sustainable increase in capacity to meet future demand. The procurement process for identifying the contractor who will build the crossing is already under way and Transport Scotland expects to announce the organisations selected to tender for the main works later this month. The construction contract is expected to be awarded in Spring 2011, with work commencing later that year. Transport Scotland will be holding a series of Public exhibitions starting tomorrow, featuring full information on the Parliamentary Bill and supporting environmental documentation. These will be held at North Queensferry, South Queensferry and at the Holyrood Hotel in Edinburgh. Leaflets, maps, new artist impressions and a Virtual Reality Model (VRM) of the scheme will all be on display. The introduction of the hybrid Bill – the first of its type ever taken forward in Scotland - begins the first of three parliamentary stages which it is anticipated will be completed by November 2010. Stewart Stevenson, Minister for Transport, told community leaders today that the tender process for the Gourock-Dunoon ferry route is going ahead. Scotland's Transport Minister has reassured community leaders in the Gourock and Dunoon area that the Scottish Government is committed to delivering a vehicle and passenger ferry service for the area. Stewart Stevenson told the meeting in Dunoon that, following the European Commission's investigation into support for ferry services in Scotland, the Scottish Government remained committed to providing a town-centre to town-centre vehicle and passenger Gourock-Dunoon ferry service. "We look forward to the findings of the European Commission's investigation into Scotland's ferry services. Their conclusions will allow us to secure the future of the Gourock-Dunoon ferry service. "The Commission has confirmed that public financing for the operation of ferry shipping services in Scotland is compatible with State aid rules. However, this was subject to the condition that we launch a transparent and non-discriminatory public tender for the operation of the Gourock-Dunoon route and that is what we are going to do. "We have reiterated our commitment to this service on this route many times. The Commission has said the new service should be in place by June 2011 and therefore we are now moving to initiate an open and transparent public procurement process." The EC investigation concluded on October 27, 2009. It ruled that Scottish Government support for the ferry service between Gourock and Dunoon could continue, subject to a tendering exercise. CMAL have been asked by the Government to provisionally identify a suitable vessel for the route but under the EC rules the winning bidder may bring in its own vessels, replacing the old vessels currently operating on the route. The full report from the European Commission is expected to be published by the end of November. Banff & Buchan MSP Stewart Stevenson will welcome Rev Stephen Brown, United Reformed Church, Fraserburgh to the Scottish Parliament on Wednesday 18 November where he will lead the Parliament in ‘Time for Reflection’. ‘Time for Reflection’ is held in the Chamber every Wednesday during parliamentary sessions. It gives representatives from various faith groups, churches, and people of no religious affiliation the opportunity to lead the Parliament in reflection before the commencement of Chamber Business. “I am extremely pleased to welcome Rev Brown to the Scottish Parliament and delighted that he will have the opportunity to lead the Parliament in ‘Time for Reflection’. “Representatives of various churches and faith groups from Banff & Buchan have spoken before the Chamber in ‘Time for Reflection’ on numerous occasions in the past and I am delighted to see this trend continuing in the third session of the Scottish Parliament. Banff & Buchan MSP Stewart Stevenson has praised the Junior Community Warden initiative run by Grampian Police. A success in Peterhead for two years now, the scheme has been extended to Fraserburgh and was officially launched at the town's police station today. The initiative involves four primary 7 school pupils each from Lochpots School, South Park School, North School and St Andrews Schools in the town. It is designed to help contribute towards the long-term aim of reducing or eliminating children's future involvement in crime and anti-social behaviour and will involve excursions, basic first-aid training and practical exercises. "I'm delighted to be invited to attend the launch today and to hear more about the scheme. "I've certainly heard some extremely glowing reports about its success in Peterhead and I am sure that the children from the Broch who are taking part will make it equally successful here. "I think it's a wonderful initiative and helps to bring the police closer to local schoolchildren – who I am sure will also have great fun taking part while delivering a serious message." "The children are encouraged to consider the consequences of their actions and the scheme is designed to contribute towards our long-term aim of reducing the potential for future involvement in crime and anti-social behaviour. "This was a ground-breaking initiative for Grampian Police when it was piloted in Peterhead and I am excited by the prospect of carrying on this success in Fraserburgh." 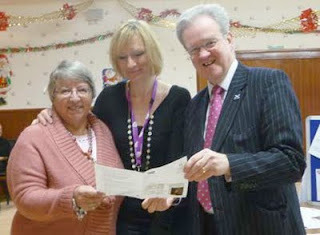 "I am pleased to see the continuation of this partnership initiative into Fraserburgh. This has been developed to engage with children and young people and to promote good citizenship, with support of Aberdeenshire Community Safety Partnership and Grampian Fire and Rescue Service." "The young people are very enthusiastic about this so I am confident this enthusiasm will carry over and make this scheme a great success." "The scheme also helps them meet new friends, develop their social skills and have fun at the same time." The Minister for Transport, Infrastructure and Climate Change, Stewart Stevenson, today announced an extension to the appointment of Mr Grenville Johnston as interim Chair of Highlands and Islands Airports Ltd (HIAL). Mr Johnston, who lives in Elgin, served as a non-executive Director of HIAL from 2001-2008. He was formerly senior partner/consultant with Johnston Carmichael, Chartered Accountants based in Elgin and was President of the Institute of Chartered Accountants of Scotland in 2000-01. Mr Johnston is currently Chair of Caledonian Maritime Assets Ltd and of Cairngorm Mountain Ltd. As Chair of Caledonian Maritime Assets Ltd, he receives a daily fee rate of £337 for a minimum time commitment of three days per month. He is also Lord-Lieutenant of Moray. Mr Johnston's interim appointment began on February 1, 2009 and was initially for eight months. The Commissioner for Public Appointments in Scotland has recently approved the extension of the interim appointment for a further six months, from October 1, 2009 to March 31, 2010. This post is part-time and attracts a remuneration of £21,880 for a minimum time commitment of six days per month. HIAL is a public corporation wholly owned by the Scottish Ministers and is sponsored by the Scottish Government Transport Directorate. The company's purpose is to maintain the safe operation of its airports and to support economic and social development in the Highlands and Islands. HIAL currently operates 11 airports in the Highlands and Islands (located at Barra, Benbecula, Campbeltown, Islay, Inverness, Kirkwall, Stornoway, Sumburgh, Tiree and Wick) and at Dundee. Total passenger numbers in 2008-09 were 1,296,303, ranging from 8,736 at Tiree to 663,985 at Inverness. All appointments are made on merit and political activity plays no part in the selection process. However, in accordance with the original Nolan recommendations, there is a requirement for appointees' political activity within the last five years (if there is any to be declared) to be made public. Mr Johnston has not been politically active in the last five years. Banff & Buchan MSP Stewart Stevenson has today (Thursday) written to the Chief Executive of the Scottish Funding Council urging him to reassess the funding arrangements currently being applied to Banff & Buchan College. Mr Stevenson has also sought a meeting with the Funding Council after being informed that some of the College’s most important courses such as Engineering and Maritime studies are being undervalued by the current funding formula. The move comes after the Scottish Parliament endorsed a motion on 1 October that encourages the Scottish Further and Higher Education Funding Council, in allocating funds to the sector, to recognise the particular needs of colleges in rural areas. “Banff and Buchan College is a first class educational facility that continues to provide excellent opportunities for young people from Aberdeenshire to develop skills that will support their transition from school to employment. “I am particularly concerned that the current funding formula disadvantages subjects such as engineering and maritime studies at the College which are key to ensuring the employability of students in the oil and gas sector. The Scottish Government has signed up as a member of an influential group leading on climate change. The Scottish Government has become a full member of The Climate Group, one of the world's most influential organisations focused on developing and sharing expertise on developing a low carbon economy. Stewart Stevenson, Climate Change Minister, made the announcement in Barcelona while attending United Nations climate change negotiations as part of preparations for the world climate change talks in Copenhagen in December. "Given Scotland's world-leading framework for tackling climate change, we have no hesitation in signing up to The Climate Group's Statement of Principles. "The Scottish Government recognises the urgency of addressing climate change and is an active partner in the common desire to identify solutions, work towards adaptation and create a sustainable future. This is why we introduced our world-leading Climate Change Act this year, making clear our intention to work to reduce carbon pollution by 42 per cent by 2020. Today's signing is a continuation of that commitment." By becoming a full member of The Climate Group, the Scottish Government has joined business organisations such as Marks and Spencer and Scottish Power, as well as administrations such as the State of California and the City of New York in signing up to The Climate Group's principles setting out its vision of the way forward in tackling climate change. All signatories pledge to take further and sustained action on climate change. "Scotland has been a member of the States and Regions Alliance for many years and we are delighted to welcome them as full members of The Climate Group. In the run up to the Copenhagen summit, Scotland is setting a great example with its ambitious targets in the Climate Change Act and through its comprehensive climate change Delivery Plan, Carbon Assessment of Government spending, and strategic approach to climate change adaptation. Scotland's commitment to green energy and the economic opportunities of the low carbon economy is impressive and far-sighted. This is a great model for other countries to follow." The Minister also spoke at an event organised by SCIAF and Stop Climate Chaos Scotland (SCCS), and held discussions with NGOs to discuss what they want as a result of the Copenhagen talks. "Legislation alone won't bring about the move to a low carbon economy and therefore this Government is taking action which will lead to real changes in everyday actions: by businesses, the public sector, voluntary and community groups and individuals. "Across the developed world, we need a cohesive approach to tackling climate change and I am looking forward to real progress being made in Copenhagen in December." "Climate change is already hitting people in developing countries hard, despite them having done least to cause the problem. In the run-up to Copenhagen, it is important to recognise how vital it is to make substantial early cuts to greenhouse gas emissions. Scotland has shown that it is realistic and achievable for industrialised countries to commit to the reductions that are needed. We welcome the Scottish Government's involvement with the Climate Group and hope that it helps contribute to an ambitious and fair UN deal."